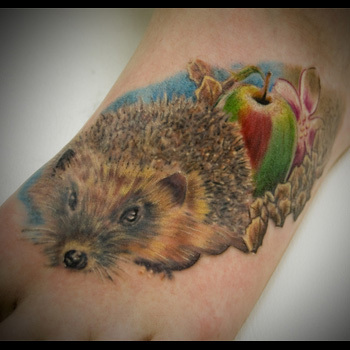 Whether you chose to have a Sonic the Hedgehog tattoo or simply love reading the tales of The Hare and The Hedgehog to children in your life, Hedgehogs and Porcupines hold an oddly lovable place in our hearts - despite their prickly appearance. How they came to be popular elements in children's stories and fairytales still remains unclear. It could be that because these animals are considered to be thoughtful providers and great caretakers for their young, this trait eventually became a standing feature of their reputation. Hedgehogs are notoriously clever. There are countless stories from ancient Greece about the animal's tendency to use its quills like a built-in backpack. It skewers grapes and berries and carries them to its layer. Pretty witty, if you think about it! Why struggle with the task of rolling your grape towards your home when it can be easily carried on your back? There is usually some confusion when it comes to distinguishing between a hedgehog and a porcupine. While it is easy to mistake the two based on their physical similarities, the animals aren't even related to each other. Porcupines belong to the rodent family and have more in common with rats than hedgehogs. They are large plant eaters (63-91 cm or 25 - 36 in) with prominent, distinctly coloured quills. On the other hand, hedgehogs aren't even remotely related to rodents. They are much smaller and more than willing to chomp down on anything (plants or insects) that strays into their paths. Hedgehog and Porcupine Tattoos are not among the more popular animal tattoo designs since the spiritual significance of these prickly little creatures often goes unnoticed and underappreciated. For those persons who identify with these animals, there are a few popular design elements to consider. Both Hedgehogs and Porcupines are considered to be totems of Mother Nature and are believed to share a close spiritual connection with the natural element, Earth. As such, wearing a Tribal Hedgehog or Porcupine Tattoo is a way to show your spiritual 'roots' and love for the outdoors. If the words Dr. Robotnik, Mobius, and Tails ring bells in your mind, then you probably spent Saturday mornings as a kid watching the Sonic the Hedgehog cartoon series or playing the videogames. In fact, Sonic is one of the most popular design features of Hedgehog Tattoos. Cartoon Hedgehog and Porcupine Tattoos are for nostalgic, fun-loving, and creative souls, so getting one not only shows your appreciation for the spiritual symbolism of the animal, but also your love for fun. You're a child at heart. The right design can be the difference between an average tattoo and really great body art. Before the needle touches your skin, you'll need to create a design that not only has spiritual significance, but also fits your general style and personality. The piece also has to highlight the beauty of your body. Our artists are more than happy to help you create a tattoo masterpiece. Simply visit our design page at www.itattoodesigns.com and take advantage of our Custom Tattoo Service.